Could ‘Thornbury Castle’ become a ‘Star’? News that Pete Waterman is putting the million or so that he is getting from his auction of his collection of large scale models into overhauling 5224, 5553 and the ‘Super D’ probably makes good sense for him but it’s more bad news for 7027 Thornbury Castle. The two GWR tanks are very useful to Heritage railways and as there are not enough engines to meet the demand on our preserved lines these days, seeing those two back in service will be very welcome. The NRM’s Super D is quite an iconic engine and is fascinating to see running so, despite its non-GWR lineage, it would be a miserable person who begrudged the money spent to give it another 10 years work. But that doesn’t stop us feeling rather depressed that 7027 is now even more at the back of the queue than ever. One of only 3 of the first 100 engines saved from Barry not yet to have steamed, 7027′s fate now seems bleaker than ever and the availability of both Clun and Pendennis on the mainline soon just compounds the problem. I, for one, say that you can never have too many Castles and I know that is talking from the heart not the head. Another Castle (and a mightily expensive one at that to restore) wouldn’t make much sense on a heritage railway either, if you just consider the economics. Undeniably beautiful and attractive to enthusiasts, drivers say they are annoyingly difficult to lubricate in the mornings and on your average 25 mph heritage line, wouldn’t you rather have another small prairie to run your services than a greyhound thoroughbred that is chafing at the bit and wants to do 80mph? I can think of two possible scenarios, though – one a compromise and one radical. 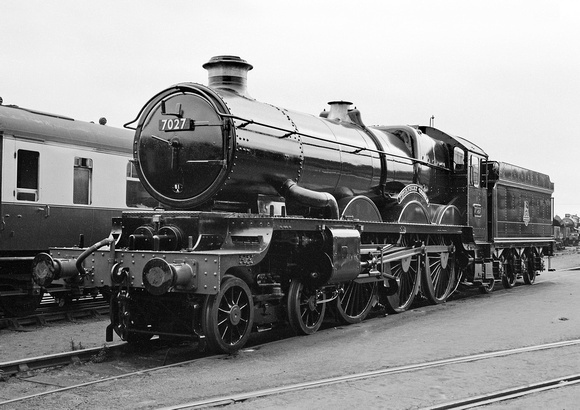 The worst of it is seeing the engine rot away at Crewe. Is there not the possibility of cosmetic restoration for display? it would safeguard a possible future restoration and would allow her to be seen by people in decent surroundings that honours the people who saved her in the first place. The second idea is completely mad but I don’t care. How about a retro rebuild into a ‘Star’? 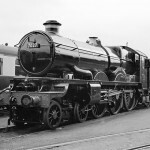 Everybody knows that the NRM will not ever allow Lode Star to steam – it is too much of an historical artefact with its Swindon applied paint job and original fittings. But soon we will have a working Saint and a County and a Grange so the thought of having a working Star to complete the 4-6-0 line-up is an exciting thought to play with. We know that there are many similarities between the two 4-cylindered classes, so much so that Star drawings were often used for Castles. The rear frames were shorter for the older style cab, the cylinders a little smaller, the boiler a standard No 1 so, as retro-rebuilds go, would it be that hard to do? And would it excite people enough to pay for it? As ever, the heritage preservation community will decide. Maybe when the Grange people have finished their engine…. ?